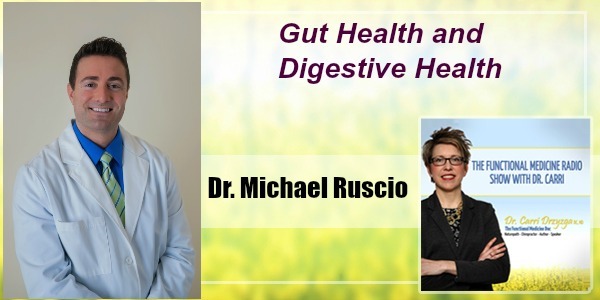 In this episode of The Functional Medicine Radio Show, Dr. Carri’s special guest Dr. Michael Ruscio talks about gut health and digestive health. What are the two gut types you’ve found? How do biofilms fit into the gut types? Can you speak about the brain-gut and gut-brain connection? What will you be speaking about at the upcoming SIBO Symposium? There are two gut types – “The Out of Shape Gut Type” and the “The Injured Gut Type”. The Out of Shape Gut just needs predominantly fibres and prebiotics and it gets better. The Injured Gut – if this person really increases their fibre intake significantly or their prebiotic intake and they get worse. There may be SIBO, or small intestinal bacteria overgrowth, or there could also be inflammatory bowel disease, something like Crohn’s or Ulcerative Colitis and this would impact the gut health and digestive health. Inflammatory Bowel Disease is one of those cases where people have a tendency to attack their own bacteria. It has been very well established that high fibre diets can make inflammatory bowel disease worse. There are certain probiotics that work really well for inflammatory bowel disease and the herbs that work really well include: Curcumin, Boswellia, and Artemisinin. Artemisinin has been shown to work well for inflammatory bowel disease and is antibacterial, anti-parasitic agent. But, without supervision from your functional medicine doctor it can have negative effects when used in high doses for too long, which would affect your gut health and digestive health. We should not say that everyone should be eating more fibre. We have to individualize it to the person. Biofilms fall into the injured gut category. What makes biofilms problematic is that when a bad bacteria or fungus gets into the body and is there for a prolonged period of time, it can then start to form this biofilm which makes the bacteria or fungal colony resistant to treatment and I think this is most noticeably seen with candida. When someone does have a biofilm they will get better from treatment, but they will relapse over the course of a few months. That’s when using a biofilm destructing agent can be helpful for your gut health and digestive health. If the gut was having more of an impact on the brain, then we may want to start with gut therapies first and what I’ve noticed clinically is it certainly seems to be that the gut has more of an impact on the brain. SIBO Symposium 2016 – I’ll be speaking about treating SIBO with biofilm agents; the use of Iberogast and its ability to prevent relapse in SIBO.